S. Sam Park at Ocean Galleries, Stone Harbor and Avalon, New Jersey This past summer Ocean Galleries was privileged to have world-renowned artists S. Sam Park, Hessam Abrishami, and, for the fourth year in a row, Peter Max as honored guests. Folks from around the Delaware Valley and beyond came to meet their favorite artist, observe their latest pieces, and learn about their techniques in an unpretentious and entertaining atmosphere. 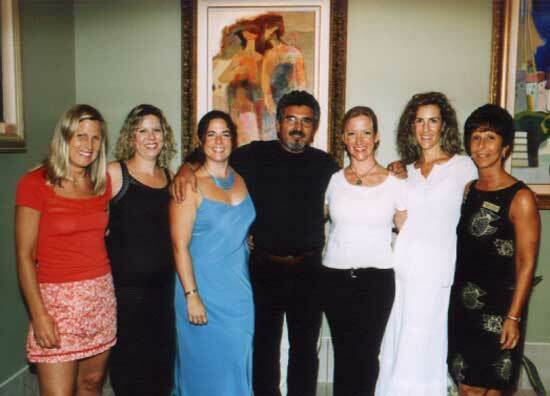 Ocean Galleries partnered with Children’s Seashore House to sponsor the 2003 Annual Art Show for children with disabilities. 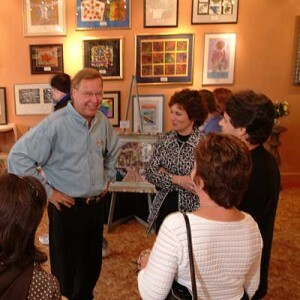 Numerous pieces of children’s art, as well as an original Sam Park oil painting, were displayed and subsequently auctioned off by former Philadelphia Eagles quarterback and football hall of famer Ron Jaworski. Proceeds benefited Children’s Seashore House. 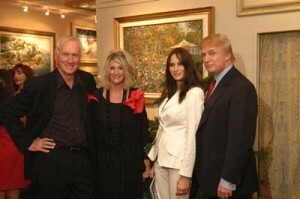 America’s “Master of the Palette knife,” Howard Behrens, opened his exhibit, “A Tribute to Monet,” at Ocean Galleries. Behrens acknowledged that Claude Monet had perhaps the most important influence on his works. 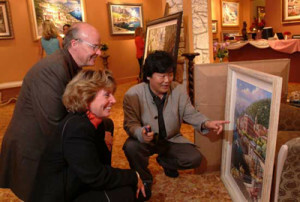 Also unveiled at the show was Behrens’ exclusive painting commemorating the 2002 Winter Olympics. Special guests at the show included mogul Donald Trump, model Melania Knauss, and former Philadelphia 76ers president, Pat Croce. 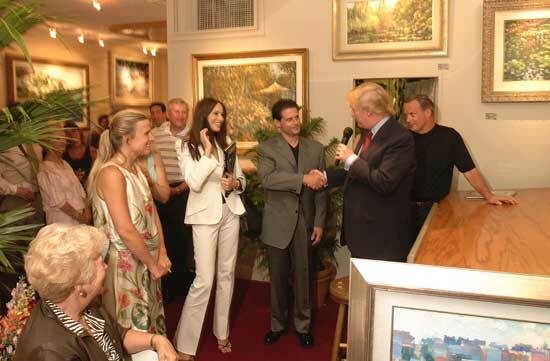 Donald Trump and Ocean Gallery owner Josh Miller shake hands. Pop artist Peter Max collaborated with Ocean Galleries and the Philadelphia 76ers to design a specially painted basketball that was auctioned off at Ocean Galleries and benefited the Sixers Charities. 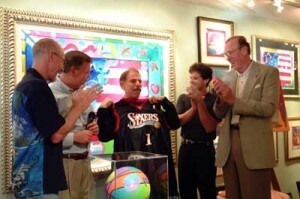 Former 76ers president Pat Croce served as auctioneer. Founded in 1996, Sixers Charities serve the community and its children. By assisting organizations that center on youth, recreation, health and education, the club touches over 35,000 kids in the Delaware Valley each year. 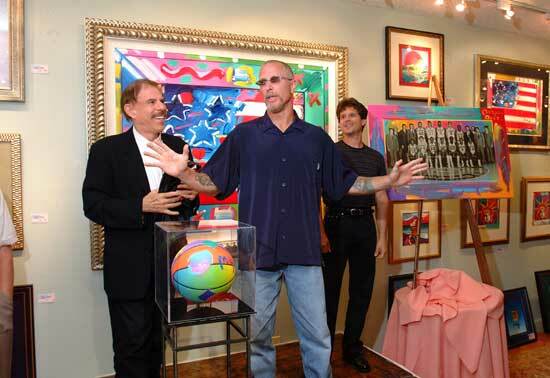 Pat Croce is flanked by Peter Max (left) and Josh Miller (right) as he unveils the Peter Max painting of the 1983 Sixers championship team and painted basketball.